We report the first case of dental flossing behavior by a Japanese macaque. We used cross-sectional data to assess the presence of this novel tool-use behavior at the group-level. Although this behavior was performed frequently by a central middle-ranking middle-aged female during her grooming interactions, and appeared at least four years ago, it remained idiosyncratic to its innovator, and until now has not spread to other group members. We examined the factors that may have favored this innovation, including the environmental context, the individual characteristics of the innovator, and the structural and functional aspects of the behavior. Group size, kinship, and dominance are socio-demographic factors that are likely to limit the opportunities for any group member to observe the innovator, and thus constrain the diffusion of this potential candidate as a new behavioral tradition. This is one of the rare studies to document the spontaneous appearance of tool-use behavior in primates under natural conditions. 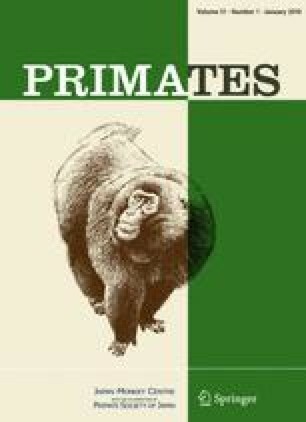 Identifying the determinants of innovations and the constraints on their diffusion within social groups of non-human primates is of special interest to understanding cultural evolution. The authors’ work was funded by a Grant-In-Aid for scientific research (no. 1907421 to M.A. Huffman) sponsored by Ministry of Education, Culture, Sports, Science and Technology, Japan, by a JSPS (Japan Society for the Promotion of Science) postdoctoral fellowship to J.-B. Leca (no. 07421), and by travel funds from the HOPE Project, a core-to-core program sponsored by JSPS. We thank S. Asaba, J. Hashiguchi, S. Kobatake, and S. Tamada from Iwatayama Monkey Park for helping us during the course of the study. For occasional assistance with data collection, we thank N. Tworoski. We thank P. Vasey for providing us with longitudinal data on the study group. We thank T. Nishida, W.C. McGrew, and two anonymous reviewers for fruitful comments on the manuscript.